Episode 1 : "Please Help The Orphans"
Mrs Lipton is still nagging Alf to get a divorce, but Alf gets an old Music Hall pal (played by Barbara Windsor) to act as his wife and refuse to divorce him. James and Ivy are asked to go to the park and pretend to be a courting couple in order to spy on Lady Agatha and her new man, whilst there they also see Mr Teddy and Miss Cartwright's maid Rose! Meanwhile Alf is busy making money by telling Mrs Lipton to bake cakes for the orphanage, when really he is selling them to make money. Episode 2 : "Current Affairs"
Sir Ralph, who has been at the Meldrum household since his seizure in the park, is convinced his wife is trying to poison him and gets Ivy to taste everything for him, including his sleeping pills! Alf's pal Myrtle arrives at the Meldrum household and pretends to be Alf's wife, but will she manage to convince Mrs Lipton? Alf is still making money by selling Mrs Lipton's cakes to the Sunshine Pantry. Mrs Lipton realises that Alf has been lying to her and finally flips. Episode 3 : "Mrs Lipton's Nasty Turn"
After Mrs Lipton's fit of anger and smashing Lord Meldrum's crockery, she is left wondering if she is to get the sack. Meanwhile Ivy visits the Sunshine Pantry and discovers exactly where Mrs Lipton's cakes have been ending up. Mrs Lipton takes to her bed after being used as target practice by Lady Lavender and her semolina pudding. Miss Poppy introduces Dickie Metcalfe to her family and Miss Cissy informs her father she is going to stand for election for the socialists. 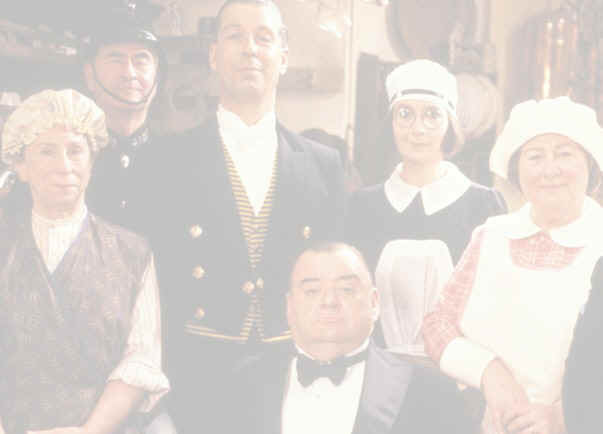 Episode 4 : "Meet The Workers"
Lord Meldrum is invited to join the Board of Governors, but feels that he must get to know the working classes and invites some of the workers from the Union Jack Rubber Company to a fish and chip supper, which Alf sees as an insult. Miss Poppy decides to get engaged to Dickie Metcalfe. Episode 5 : "Gretna Green Or Bust"
Miss Poppy and Dickie Metcalfe plan on eloping to Gretna Green, and the rest of the household are chasing them to stop them, but they don't realise that Mr Teddy has the same idea with Madge Cartwright's maid Rose. Episode 6 : "The Night Of Reckoning"
Sir Ralph approaches James with a job offer as Butler at his home, which James has to consider very carefully. Alf comes up with a solution to Mr Teddy's problem, but Mabel is about to be evicted from her home, can anyone help? Episode 7 : "A Day In The Country"
Lord Meldrum decides to treat his serveants to a day out in the country, but when they arrive Lady Agatha, Sir Ralph and their staff are there too. A good time is had and Mabel turns into a lady for the day!